Natalie is fantastic!! Beyond my husband, she was the best decision I made about our wedding day. I would highly recommend her for your wedding. She has a wonderful attitude, is focused, and wants your day to be the best. We live in Ohio and got married in Santa Barbara so I found Natalie online. From our first phone call, I never doubted that she was not going do a great job. She made our wedding day so easy. I did not have to speak to a single vendor the day of our wedding. Throughout the planning process, she was on most of my calls with the venue and always made sure they understood what I wanted. She made me feel confident in my choices and that they were not unrealistic ideas or suggestions. I cannot say enough good things about Natalie! Initially I was not sure if I should hire someone to help with the day of coordination for my wedding. I figured that I would get all of my family members to help out. Then I realized that although I had a great family who is willing to help it was going to be hard to have them be part of the wedding and enjoy it at the same time. I did some research and I made sure that who I hired to help with this special day would be trustworthy, motivated, and have some experience. I'm glad I ran into Natalie's site. I could see she would be the right person to help out. For example, the day before my Wedding I was super overwhelmed and stressed because I had decided to do all of the work of looking for décor, DIY projects, and staying within budget. I wanted our Wedding to have all the special details I had created and look nice. I have to say Natalie Pulled it off!! She was so welcoming and just confident when I finally met her the day before the wedding. I remember he saying "leave it all to me!" When I heard her say it with such confidence, I felt a weight lifted off my shoulders. Natalie took all of the items I had created and purchased into her place to set up the next day at the venue. I allowed myself to trust in her to set it up with a short time span because our venue was not available the whole morning for set up. We had discussed this already over email and phone. When we arrived to the Venue, it was exactly how I imagined it to be and throughout the night Natalie was on top of everything we needed. If we needed something to get done she was on it! Natalie coordinated the event flawlessly and worked wonderfully with the DJ also. 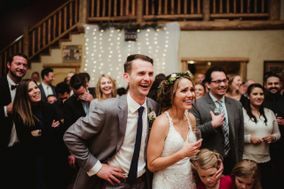 If you are looking for someone who you can depend on for coordinating the day of your wedding Natalie is a great choice. She has the energy and enthusiasm to help, she is reliable and knows what she is doing. Natalie is Amazing! Great Experience, down to earth and Helpful. Natalie was great. Her services were within our budget and she rocked it the day of the wedding. We met up the night before to do a handoff and day of the wedding she helped as the coordinator and official herder of cats. It was such a relief to have her help. We did a few skype calls leading up to the event. Highly recommend working with Her! I cannot recommend Natalie highly enough! She is extremely knowledgeable about all things wedding and will always give you her honest opinion in order to make your day the best it can be. She's outgoing and easy to work with and will make sure everything goes according to plan. She even made sure that there were no people in the background of our wedding pictures which took place on a public beach. Thanks for everything Natalie! Natalie was very professional and made my day perfect and stress free. I would highly recommend her as a day of coordinator, she made sure everything was handled and executed perfectly.